The Multiple Deviation Bands are a generalized version of the Bollinger Bands. 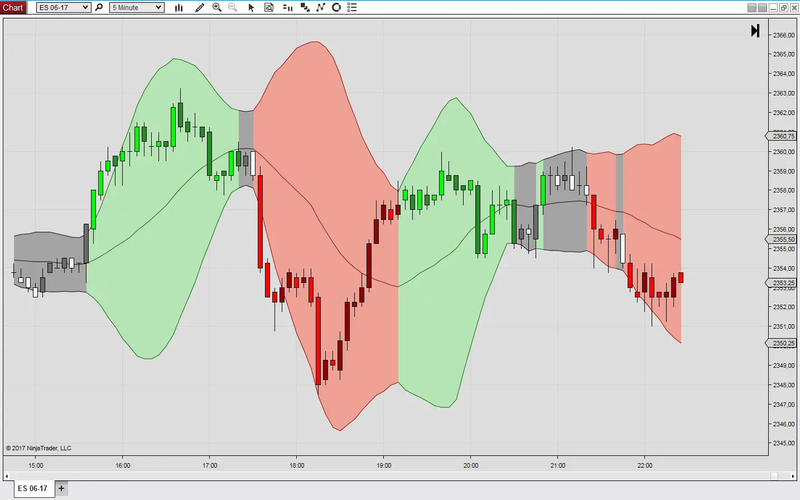 While the Bollinger Bands are built from a SMA with standard deviation bands, this indicator allows for selecting one of over 30 different moving averages as the midband and comes with 3 different algorithms to calculate the bands. The Multiple Deviation Bands indicator consists of a midband and an envelope. You may select one of over 30 different moving averages as the midband. Midband and envelope are colored according to the slope of the midband, which can be upsloping, neutral or downsloping. There is a parameter to adjust the flatness which is considered as neutral. All slope calculations are volatility adjusted. The sign of the slope is exposed as public property and can be used as a trend indication. The trend can also be shown via paintbars. For calculating the deviation bands, 3 different formulas can be used. The default setting uses the mean absolute deviation (MAD) from the selected moving average. Alternatively, the median absolute deviation (MAD) or the root mean square deviation (RMSD) can be used. The upper band is obtained by adding a multiple of the deviation to the midband, while the lower band is obtained by subtracting a multiple of the deviation from the midband. Unlike for classical Bollinger Bands you may use different lookback periods for calculating the midband and the deviation. The Multiple Deviation Bands can be used in a similar way as the classical Bollinger Bands. In particular they can also be used to detect a “Bollinger Squeeze” when the market is range bound and will signal a breakout after the squeeze.